Hello everyone! I know, it's been a bit since my last post, but I'm back. Over the past few weeks, I've been getting really interested in indie brands of cosmetics and places a whole bunch of orders to try some things out. 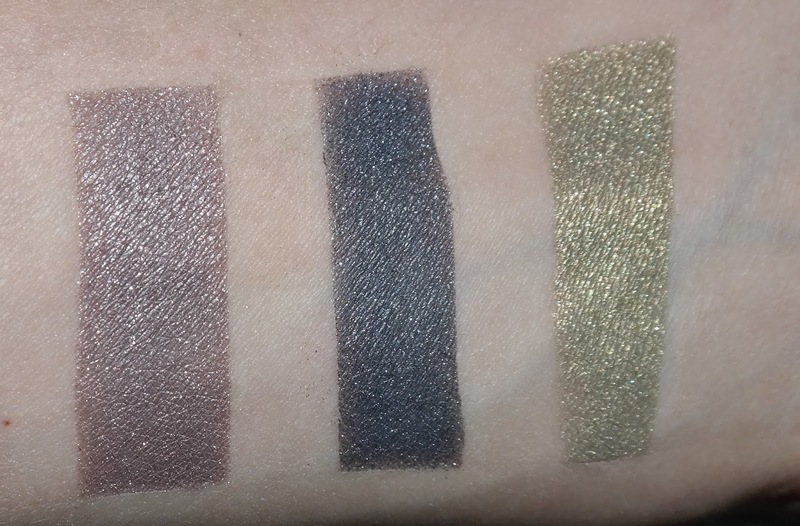 If you've been a reader since last year, then you may remember that I've already dabbled in the indie realm when I placed a large order of Shiro Cosmetics samples. I don't know what sparked my interest in indies again, but I'm so glad that it happened! I've already received products from three companies and I have four more orders on their way (one of which is from Shiro :D). One of the best things about the indie community is that the store owners realize that their customers may want to sample a product before buying a full size, so most companies offer sample or trial sizes of their products. For the majority of my orders, I only ordered sample sizes or did a "blogger pack" so that I was able to inform you guys about the products. First up on the chopping block is Scaredy Cat Cosmetics which is actually based out of Kansas City (and I am too), so I got my order incredibly quickly. That is actually something to note about indie makeup; most of the companies are owned by people who work another job; this means that you might have to wait a few weeks for an order. Regardless, Scaredy Cat is literally about 15 minutes from my house, so it was like next day shipping on my order. 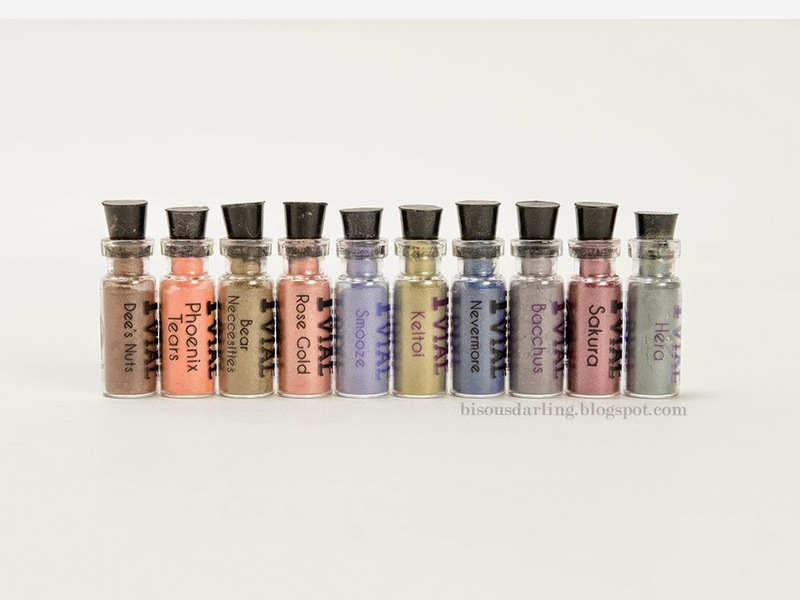 I ordered a ten pack of the trial vials and got the colors below. There was a slight problem with my first order due to a printer mishap, so Kelly, the owner, sent me the correct items with some extra vials! In the indie industry, you see a lot of product measurements; things like a sample being an eighth of a teaspoon or a mini jar having a fourth, etc, etc. Scaredy Cat's trial vials don't have any exact measurements, but they are filled to the brim with product and considering that they're a buck a piece, it's pretty generous. 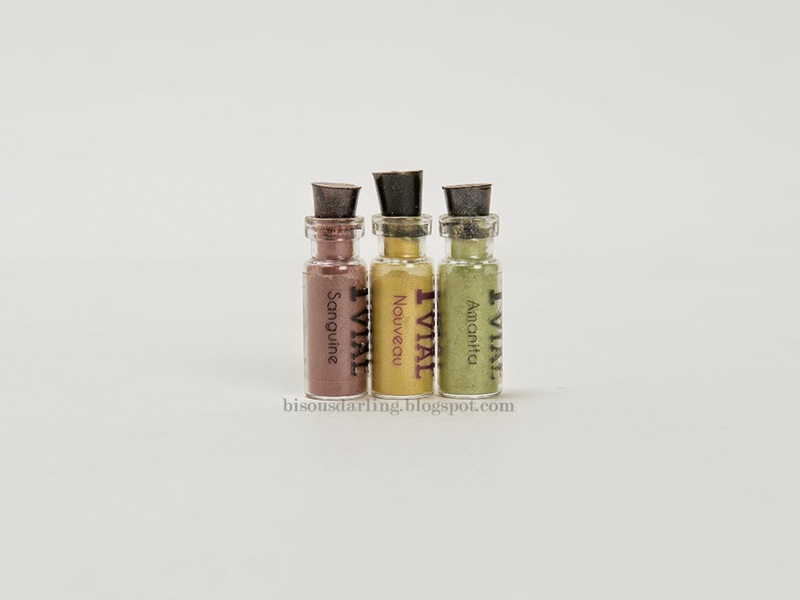 The vials, while amazingly cute, do prove to be a bit inconvenient since you can't get a brush in them. This is perfectly fine by me since I do plan on pressing these into solid shadows, but for those of you who prefer loose will need to get a bigger mouthed container to transfer these into. The shadows are all gorgeous, but vary a bit in their opacity. 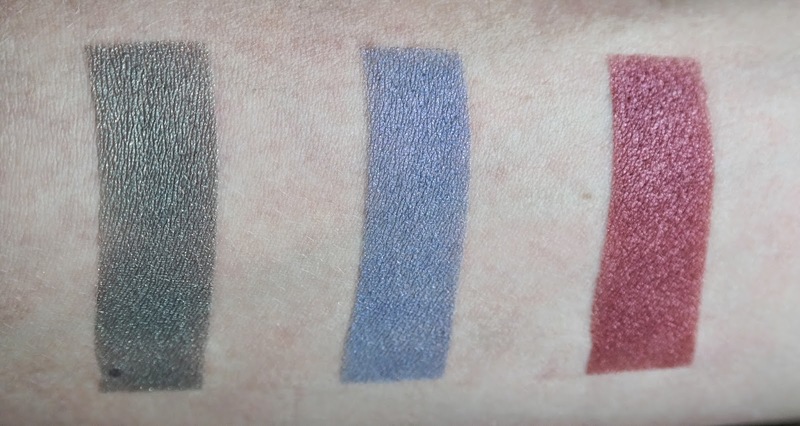 I applied these all over a matte Maybelline Color Tattoo (I can never remember the name of it) but will continue to experiment with bases for these. 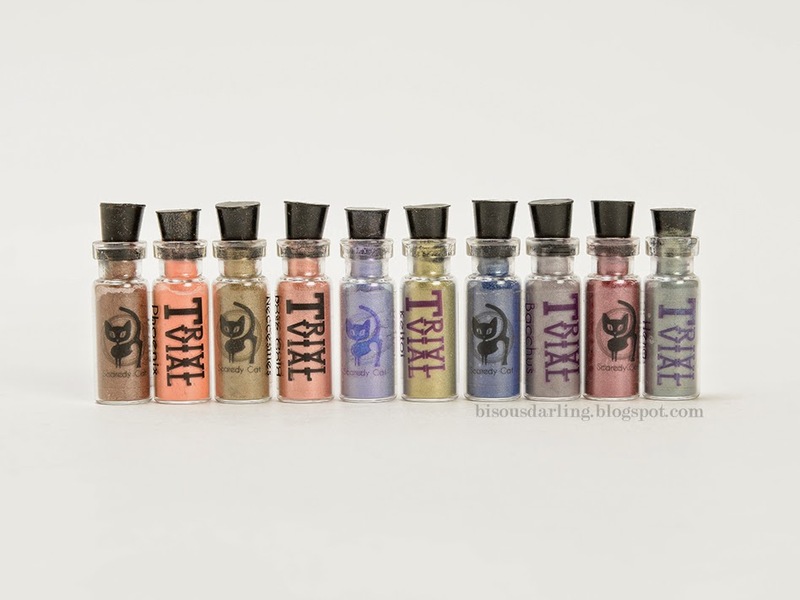 As I'm diving deeper into this crazy world of indie makeup and the beautiful sparkly shades that are created, I have begun to realize that I need to buy a full size Pixie Epoxy from Fyrinnae or something similar from E.L.F. 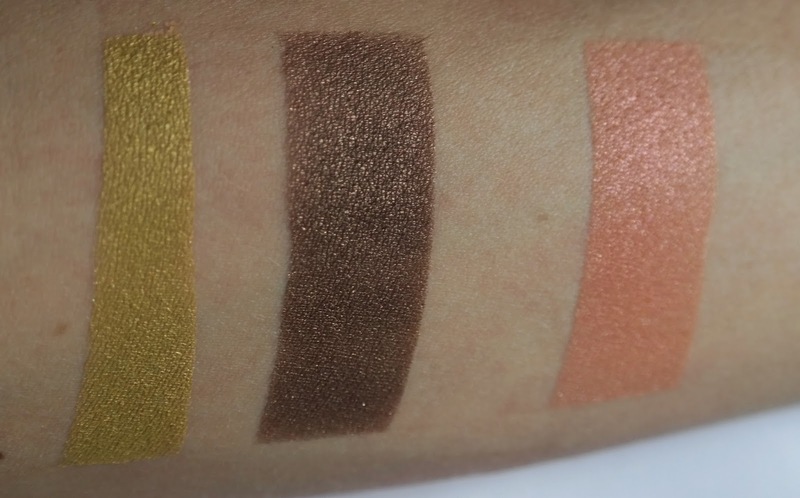 All of the following swatches are done over the Maybelline Color Tattoo. The colors that needed the most help getting up to a full pigmentation were Hera and Smooze, everything else got fairly opaque very easily. I think that Hera would really benefit from a stickier base like Pixie Epoxy or Darling Girl's Glitter Glue. 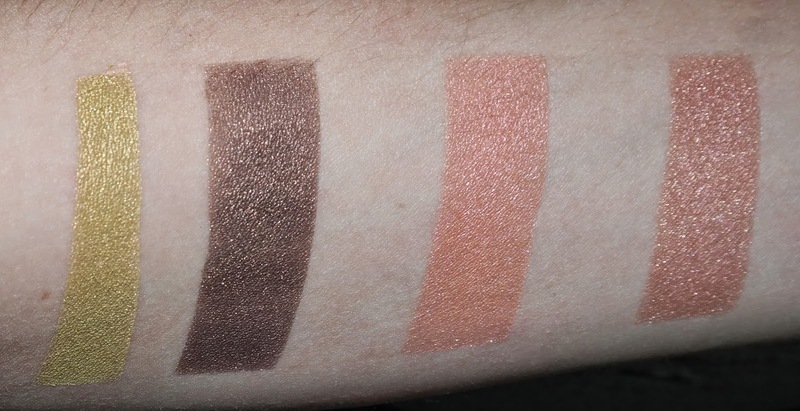 My favorite shades out of the all of them are Bacchus, Rose Gold, Phoenix Tears, and Sakura but don't let that fool you into thinking that I don't like the rest; I've got a pretty big hard on for all of the shades. And there you have it. I have used these shadows on my eyes which is also what swayed my "favorites" :) If you have any questions, please don't hesitate to ask! ooooooh my gawsh. I favorited their Etsy shop ages ago and haven't ordered anything yet. Now I NEED to!! Get the Pixie Epoxy for sure! I ordered a bunch of shadows and the epoxy from Fyrinnae a couple of weeks ago and it is effing brilliant. So. Much. Sparkle. And sheen! And shimmer! I was like a magpie crooning over my pretties.